According to a new report by Transparency Market Research (TMR), the global market for HVAC and refrigeration (HVACR) systems demonstrates a highly competitive and fragmented structure with no clear leadership. Only a few companies, such as Daikin Industries Ltd., Mitsubishi Corp., Haier Electronics Group Co. Ltd., Carrier Corp., have been able to establish themselves as key vendors of HVACR systems across the world. Currently, the leading market players are focusing aggressively on developing energy efficient refrigeration systems in order to curb the energy consumption of equipment. However, over the forthcoming years, these companies are likely to begin engaging in mergers, acquisitions, and various strategic partnerships in a bid to expand their business through new service additions and geographical presence. As per TMR’s estimations, the global HVACR systems market, which stood at a value of US$81.1 bn in 2015, is likely to progress at a CAGR of 5.50% between 2016 and 2020 and reach an opportunity worth US$130.7 bn by the end of the forecast period. Boosted by the augmenting demand for refrigeration equipment in cold storage and food processing units, the shipment volume of HVACR systems is estimated to rise at a CAGR of 8.0% over the same forecast period. Evaporators have emerged as the most valued product in this market in the last few years and are expected to remain so throughout the forecast period. The revenue generated by evaporators is estimated to cross US$34.1 bn by 2024. Geographically, the worldwide market for HVACR systems is spread across South America, North America, the Middle East and Africa, Asia Pacific, and Europe. Among these, Asia Pacific acquired the leading position in 2015 with a share of nearly 36% in the overall market. Thanks to the robust rise in the tourism industry, researchers expect this regional market to maintain its dominance during the forecast period. Due to the high pace of urbanization, Australia, India, Japan, China, and South Korea are likely to drive the market for HVACR systems in Asia Pacific over the next few years. Apart from this, North America and Europe are also expected to register a healthy rise in their respective markets for HVACR systems market in the forthcoming years, states the research report. “As new hotels, restaurants, cafes mushroom across the world, HVACR systems gain a significant rise in their demand,” says the author of this study. The expansion in the global tourism industry has boosted the emergence of a number of hotels, restaurants, and cafes, worldwide. To maintain the quality of food products and to meet the standard for food safety, the adoption of HVACR systems has increased considerably in these enterprises and the trend is likely to remain so over the forecast period. The rising consumption of processed food and beverages is also expected to fuel the demand for HVACR systems in the coming years, notes the study. 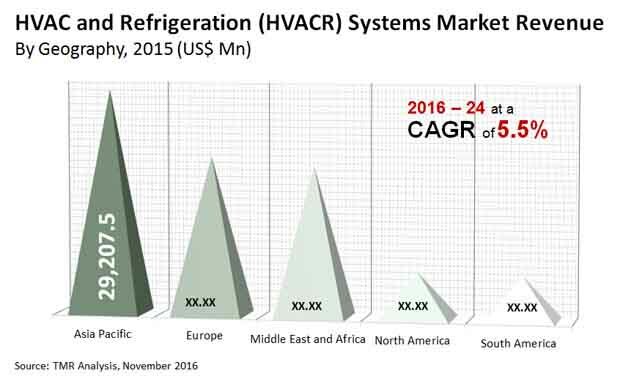 While the future prospects of the global HVACR systems look bright, the high total cost associated with refrigerator counters is likely to hamper the market from growing steadily. Besides, the implementation of Montreal and Kyoto protocol is also projected to limit the adoption of these systems in countries in agreement with these protocols, resulting negatively on the overall market in the long run.